If you do a search for this film you’ll discover what my thoughts are of it. This on the other hand is a nice press release and, possibly, the only good thing from the film! I’ve given it you, unedited, so you can decide. Not only has Meghan Trainor written a song for the film, she has a peanuts-inspired doppelgänger of herself. Good grief, blockheads, does it get any better than this? Underdog Charlie Brown has finally landed The Little BLONDE Haired girl. None other than Grammy® -nominated and multi-platinum global superstar, Meghan Trainor, announced today she is recording an original song for SNOOPY AND CHARLIE BROWN: THE PEANUTS MOVIE. 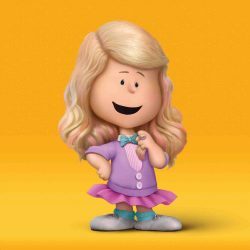 To celebrate the occasion, Meghan’s fans can check out her social sites for a Peanuts-inspired image of the pop star in true-to-style round headed glory. In SNOOPY AND CHARLIE BROWN: THE PEANUTS MOVIE, Charlie Brown, Snoopy, Lucy, Linus and the rest of the beloved “Peanuts” gang make their big-screen debut, like they’ve never been seen before, in stunning state of the art 3D animation. Charlie Brown, the world’s most beloved underdog, embarks upon an epic and heroic quest, while his best pal, the lovable beagle Snoopy, takes to the skies to pursue his arch-nemesis, the Red Baron. From the imagination of Charles M. Schulz and the creators of the ICE AGE films, SNOOPY AND CHARLIE BROWN: THE PEANUTS MOVIE will prove that every underdog has his day. Charles Schulz drew the most popular and influential comic strip of all time, which was read every day by 355 million people in 75 countries. Steve Martino directs SNOOPY AND CHARLIE BROWN: THE PEANUTS MOVIE; previously, he brought to the big screen (with Jimmy Hayward) Fox/Blue Sky’s Dr. Seuss’ Horton Hears a Who! Martino also directed (with Michael Thurmeier) Fox’s recent box-office smash Ice Age: Continental Drift. Craig Schulz and Bryan Schulz, respectively Mr. Schulz’s son and grandson, along with Cornelius Uliano, Paul Feig and Michael J. Travers are producing. Feig, the director of the blockbuster comedies “Bridesmaids” and “The Heat” and “Spy,” is a lifelong “Peanuts” fan. SNOOPY AND CHARLIE BROWN: THE PEANUTS MOVIE soundtrack will have its worldwide release on October 23, 2015 on EPIC Records. Meghan Trainor is preparing her headline summer tour —THE MTRAIN TOUR—supporting her #1 debut album, Title, on Epic Records. For more information on Meghan, visit her website.